The Valley of Jaumave in the state of Tamaulipas is spectacular for the proximity of very different habitata. This photo was taken from the floor of the valley, which is tropical or subtropical dry scrub. 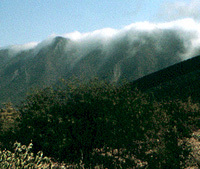 The top of the mountains that separate the valley from the Gulf of Mexico, seen here shrouded in clouds, support dripping cloud forest, with tree ferns, moss, and abundant epiphytes.